Native American Indian jewelry has been made by Native American women for thousands of years. When the Indian women first started making jewelry they used many different things that could be found within the tribal territory. Some of the materials used for ancient Native American Indian jewelry sometimes included shells and pieces of bone that were carved and hollowed out to be strung on animal sinew; they would also carve wood into beads and died them different colors. Other items that were incorporated into much of the Native American Indian jewelry were sometimes things that were sacred to the Native American people, and also some tribes used precious stones such as turquoise, which is probably one of the most common stones seen on Native jewelry. The jewelry made by the Native American tribes was different among all the tribes and their materials were the same until many tribes began trading among one another and also settlers soon arrived and trade increased. Much of the bead jewelry started out among many of the Plains and Woodland tribes that inhabited the Midwestern areas of the United States now. The Navaho Indians were the first tribe to start making silver Native American Indian jewelry; it is believed that the Navajo people learned the art of being a silversmith from Spanish settlers. They took up the trade when they stopped being a nomadic tribe and settled down. The tools the Navajos used though were very crude, but what they accomplished with these was pretty amazing for the times. 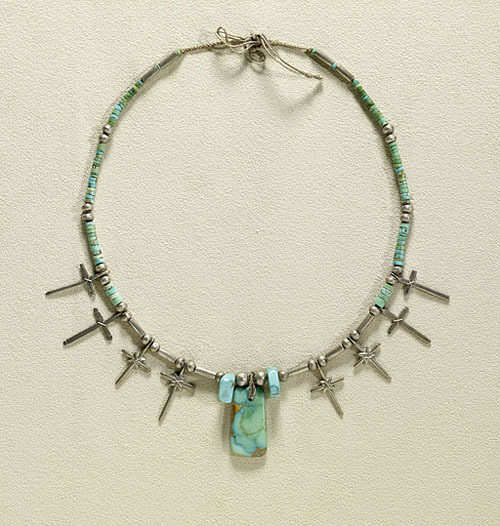 Native American Indians, especially the Navajos, are famous for their beautiful turquoise and silver Native American Indian jewelry. The Native Americans were extremely close with the earth and the majority of tribes were very spiritual people. They believed that certain animals such as birds and bears possessed special powers so they would carve these spirit totems into their jewelry and then wear them for good luck. The jewelry of the Native Americans can be seen worldwide today and is still very fashionable among the Native American culture. Indian beadwork is popular to this day as well, but some of the most popular Native American jewelry you will also see is some of the beautiful turquoise and silver hand crafted pieces.